We plan to move in there very soon. Friendly, cooperation staff. Thank-you for the great review! We are very proud of our community and keep it in tip-top shape for our residents. Thanks again for taking the time to share your feedback with us! Élan Westpointe is very a nice place and spacious. They give you all the right answers, and the food is not any better than all the other nursing homes. I would say it's a great place for assisted living, but if you're coming for great food, then don't bother. They have nice activities. If you want to stay busy then you can stay busy. They have a good activity director, and that's really important. She always welcomes suggestions and stuff like that. The pet answer around here is, "We're going to look into it," but they never get back to you. That's the reason why a lot of things aren't successful, because of the lack of communication. It's part of the problem here. They're short staffed. For example, it took them four days to get the trash in my room picked up. And you have to argue with them because they'll argue that I don't have much trash in here, but I don't want it sitting around because there's diapers in there for four days. They said it won't happen again, and then it happened again. I had to argue with the person who picks up the trash. Attitude is everything. We're having problems getting help, which is really bad. The food seems stale and tasteless. Thank you for providing us with this valuable feedback. We would welcome the opportunity to have you stop by again, I think you'll be very satisfied with our new chef. We're sorry we never got back to you about pets, we are a Pet-friendly community and accept cats and small dogs. Your feedback is important so that we can meet and exceed expectations. I was very impressed with Elan Westpointe. It was well kept and did not smell. It was like entering an apartment building. During the tour, all the residents looked well kept. It was a very nice experience. They do the laundry and they also have a dining area. I met some of the staff who would work with my husband and assist him with his medication. The bathrooms had roll-in showers and holding bars. They also had a small exercise room with equipment for moderate type of exercises. They had movie nights with popcorn, Bible studies, Church services, and a van that could take them to doctors' appointments. The food smelled really good even though I was not able to try it. WOW! Thank you so much for taking the time to provide us with your honest feedback! Our employees are absolutely great and they all take their jobs very seriously. They are there when you need their assistance and all have such lovely energy about their work. Thanks a million for sharing your experience with us! You are a GEM! We went to the Élan Westpointe assisted living and memory care sections. The staff seemed very caring. The facility was very new and very trendy. The rooms were over the top and very beautiful. It did not look like an assisted living place. You would think you were in a hotel in the mountains. It's a very beautiful place. Thank you for the great review! We are very proud of our community and keep it in tip-top shape for our residents. Thanks again for taking the time to share your feedback with us! Elan Westpointe's rooms were adequate. The facility and activities were good. The place is pretty new and nice. I placed mom in the memory care of Elan Westpointe. They're fantastic, they're taking good care of her, and going above and beyond in making her happy. They take her to symphony orchestras. The food is more than sufficient, very well-done, and they have a very good chef. They have memory activities, all types of painting, artwork, Bingo, and social hours every Friday. Élan Westpointe's price seemed to be very high in comparison to others. The guy that was showing us around commented that he didn't know if he could show us any apartments because sometimes people don't really like anybody looking at their rooms, which was ridiculous and a turn off. It didn't feel welcoming. We didn't even get to eat in the dining room because he didn't want to take up anybody's seat, which was a turn off, too. The facility was nice and the smallness of it was good for some people. It didn't have much; there wasn't a pool there. You get less square footage as well. They were also going through some company and employee changes. One lady showed me around, and when I went back a week later, she was gone. It seemed unstable, but they were going through a transition. Élan Westpointe is a wonderful community and it looks beautiful. The staff is professional, courteous and very caring, so I was happy with it. They found out the things my mother likes to do, and make sure she's included in those activities. They do arts and crafts, games, movies, music, and they have a happy hour on Fridays where people can get together and listen to music from their generation and socialize. They also have a therapy dog in the community where residents can interact with the dog. My mother was able to eat well. She has had no complaints with the food. We would like to thank you for taking the time to provide us with your honest feedback! Our staff are the best in the industry and they all take their jobs very seriously! Thanks again for the amazing feedback. You are a superstar! Élan Westpointe was assisted living, but they said we don't have to get the additional services and can just live there independently. It seemed to be for people that need more attention and care, but we're not there yet. They provide housekeeping, laundry, meals, and transportation. We also had lunch there. The portions were a little small, but the quality of the food was good. The staff we talked to was very nice. Élan Westpointe was very nice, they were very hospitable, and the place looked brand-new. I was impressed with them, and the dining area was nice. They were very nice and clean, the people are very friendly, and the residents were nice. Élan Westpointe is very new and very attractive. The people were very friendly and informative. We saw a couple of models for the rooms, and they're very nice and attractive but probably a little smaller than expected. The dining room looked like a very nice, small restaurant. It was a good experience for us. What I liked about Élan Westpointe was the fact that people could age out in the facility. The staff seemed very nice. It was a large facility so there was lots of space for activities. One thing we didn't like was the fact that they didn't have one big room for my parents-in-law to live in. They'd have to use two rooms that were next to each other, so we'd have to use one room as a bedroom and one room as a living space, meaning we'd have to pay for two rooms. The facilities and activities were nice though. They have a lot of outings for their residents. My father-in-law could participate in the assisted living field trips as well as the memory care field trips, which I like. They have a nice game room and crafts. I also think they'd be very good with my mother-in-law as far as memory care activities. I still think they should have one room big for couples though. Thank you for your feedback! It's always great to hear how we could make our community even better. Our staff are great at providing the best activities for our residents. Thanks again for your feedback. Step into the unexpected. Stunning, but casual. Elegant, yet comfortable. More like an urban lodge or boutique hotel than a traditional senior lifestyle community. At Èlan Westpointe, you’ll discover concierge-style services, resort-quality amenities, and a compassionate, respectful staff always at hand to offer assistance with daily living and specialized memory care. We have a beer and wine license, so have an on-site pub! 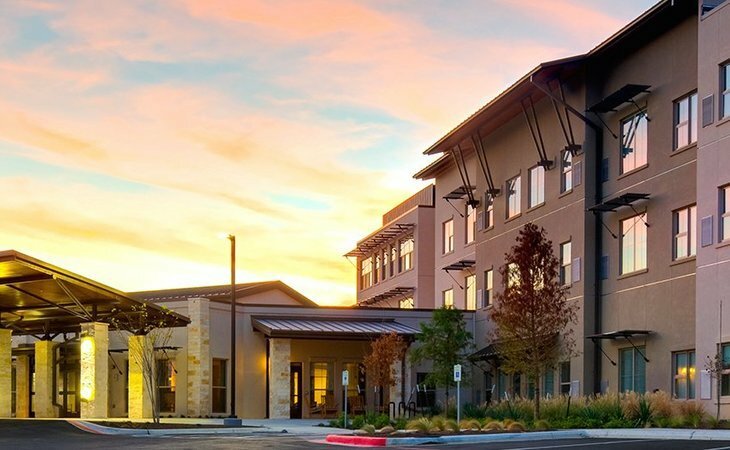 --- We have amazing views; our community is built on the highest point in New Braunfels --- We have Independent Living all the way to full dementia care, so you can age in place (don't have to move). What should caregivers and potential residents know about Élan Westpointe?